Whitening, also known as bleaching, is the procedure used to brighten teeth. We are pleased to offer our patients both in office ZOOM!® Whitening or ZOOM!® take home treatments. While results vary from person to person, your smile will be noticeably whiter with Philips ZOOM!®. With Philips ZOOM!® WhiteSpeed, you can get up to eight shades whiter teeth in one 45-minute office visit. Philips ZOOM!® DayWhite and NiteWhite take home treatments offer a dramatically whiter smile in one to two weeks, and unlike over-the-counter options, your dentist will work hand in hand with you until you’re completely satisfied with your results. To help maintain your beautiful new ZOOM!® smile, we also offer the Endless Whitening program. Patients who purchase either the in office or take home ZOOM!® treatment will be eligible to receive a maintenance ZOOM!® treatment with every visit as long as they maintain their regular hygiene appointments. We want to help our patients maintain their beautiful, healthy smiles! 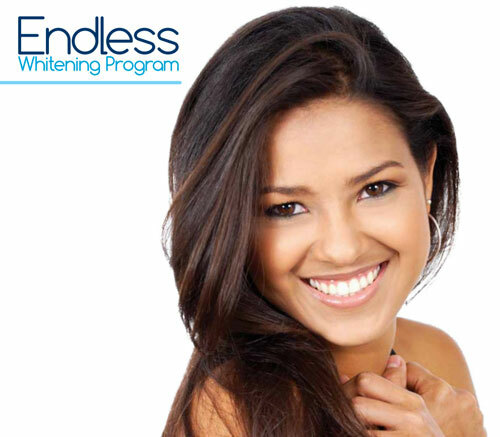 For more information regarding the Endless Whitening program, please give us a call.